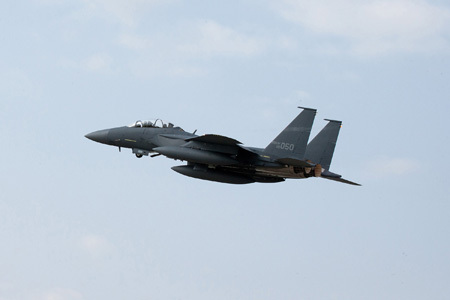 DAEGU AIR BASE, Republic of Korea, June 2, 2011 -- The Boeing Company [NYSE: BA] delivered two F-15K Slam Eagle aircraft -- designated F-15K49 and F-15K50 -- to the Republic of Korea Air Force (ROKAF) at Daegu Air Base on May 30. The aircraft departed the Boeing St. Louis facility on May 25 and made stops in Palmdale, Calif., Hickam Air Force Base, Hawaii, and Anderson Air Force Base, Guam, before arriving in Korea. "Boeing has now delivered 10 F-15Ks to the Republic of Korea under the Next Fighter II contract," said Roger Besancenez, Boeing F-15 Program vice president. "We remain laser focused on providing first time quality on every F-15K we deliver to this important customer. We are proud that the F-15K is a cost-certain, schedule-certain solution for the Republic of Korea." Boeing delivered the first six of 21 F-15Ks it is producing under the Next Fighter II contract in 2010 and two more in April. The remaining 11 aircraft will be delivered through April 2012. Six of the new F-15K Slam Eagles are scheduled to participate in an advanced aerial combat training exercise at Nellis Air Force Base, Nev., in early 2012. The F-15K is an advanced variant of the combat-proven F-15E. Equipped with the latest technological upgrades, it is extremely capable, survivable and maintainable. The aircraft's service life is planned through 2040, with technology insertions and upgrades throughout its life cycle. Boeing completed delivery of 40 Next Fighter I aircraft to the ROKAF in October 2008.